This is simply the Instant Pot Version of my Vegan Bean with Mushroom Bacon Soup. Dried Pinto Beans can be made into a flavorful, hearty soup in just about an hour by using your Instant Pot Pressure Cooker. And no, I did not soak my beans at all. There are many reasons to love the Instant Pot, but the fact that I can cook beans in a fraction of the time, ranks right up there near the top. I added the Mushroom Bacon in order to recreate that famous soup company’s “Bean n Bacon Soup ” that I grew up with and loved so much. And honestly? This one is every bit as mmm mmm good as that other one, without the 870g of Sodium, MSG, or 3g of fat per serving. Here is an IP similar to the one I use – mine is a DUO and has a Yogurt Feature – which I’ve never used. And remember this is an Amazon Affiliate Link so I will make a penny or two if you buy one. Ok, let’s fire up that Instant Pot and make some soup! Let’s start with the bacon – since we want to give it time to marinate. Rinse 8oz of Portobello Mushrooms and discard the stems (or save them for another use). Slice mushrooms into thin slices and toss them into a ziplock bag. Whisk together 2 Tbs of Low Sodium Soy Sauce, 1 Tbs Maple Syrup, ¾ tsp Liquid Smoke, ½ tsp Smoked Paprika, ¼ tsp Garlic Powder, and 1/8 tsp Black Pepper. Pour this into the bag with the mushrooms, seal, and shake to coat. Set this aside for now, but every now and then flip it over and give it a shake to mix. Dice 1 yellow onion and add it to the IP (instant pot) Pan. Also, add 2 diced carrots, and 2 ribs of diced celery. (Note: I was out of celery the other day and substituted a diced Red Bell Pepper and it was amazing too.). To the veggies, add 1-3 Tbs of either water or Veg Broth and press the SAUTE button on your IP. (Note: if your IP has the ability to adjust the heat, make sure it’s on LESS). Saute the veggies until softened, stirring occasionally. Add 3 cloves of minced garlic and give the veggies a stir. Add 2 cups of Low Sodium Vegetable Broth, and 3 cups of water, and all the seasonings listed below in the Recipe Ingredients. Rince 2 cups of dried Pinto Beans (removing any odd-looking beans or rocks) and stir these into the soup. Finally, add 3oz (about ½ can) of Tomato Paste. Add this directly to the center of the soup and DO NOT STIR. (Note: I’ve read where tomato products can scorch and burn if they are touching the sides). And that’s it! Attach your lid and press the MANUAL button on your IP. Make sure it’s on High Pressure (HP) and set the time for 45 minutes. When it beeps (45 minutes later), allow it to Naturally Vent for 10 minutes. In other words – don’t touch anything – it will vent on its own. While it’s venting, let’s make some bacon! Dump the entire bag of mushrooms (marinade and all) into a large skillet and slowly saute the mushrooms until they have reduced in size. It’s ok to let the marinade cook-off and evaporate. When the mushrooms begin to stick , pull them off the heat. Ok – back to the soup – our 10 minutes of venting time should be finished by now….so…. When all the steam has released, remove the lid and stir in the bacon. You can let it simmer for another minute or two to meld the flavors and taste for any seasoning adjustments. At this point, I like to give a few good shots of hot sauce (but that’s me). Hope you enjoy this Soup and as always, enjoy! Oh – and LOVE the comments! Keep ’em coming! This is my Instant Pot version of my Vegan Bean With Mushroom Bacon Soup. From dried beans to a flavorful soup in just about an hour. Super healthy and loaded with plant-based protein and beneficial fiber. Slice mushrooms and discard stems. Place mushrooms in a ziplock bag. Whisk the remaining bacon ingredients together to make a marinade and add to the bag with the mushrooms. Seal and shake well. Set mushrooms aside for now, but occasionally flip and shake bag to distribute marinade. Dice onion, carrots, and celery and add to Instant Pot. Add 2-3 Tbs of water or Veg Broth and press the SAUTE button. Saute veggies until softened and then stir in garlic. About 30 seconds later add in the water, broth, and all seasonings. Stir to combine. Rinse and drain beans and add to pot. Add the tomato paste to the center but DO NOT STIR. Attach lid and press the MANUAL button. Set time for 45 minutes. Afterwards, allow to naturally vent for 10 minutes. 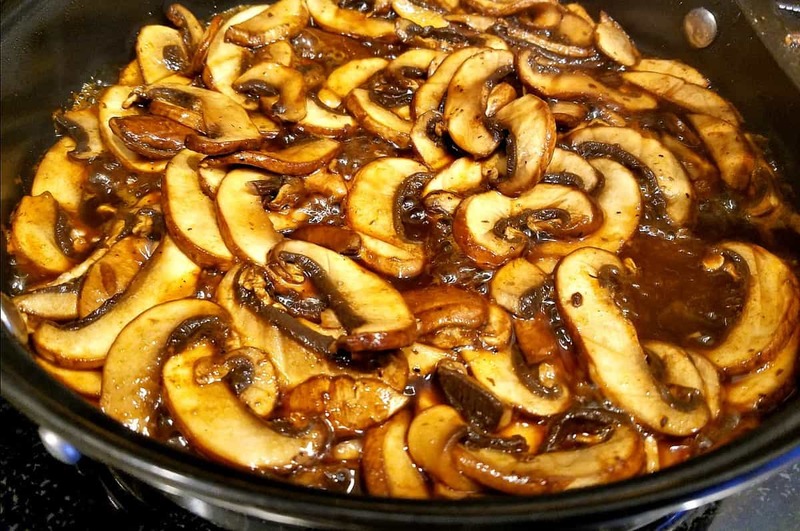 While IP is venting, dump the entire bag of mushrooms and marinade into a skillet. Saute until softened allowing marinade to cook off and evaporate. Oh my this looks good! Do you think I could slow cook all the soup ingredients for 8 hours on low and then add the mushroom bacon at the end? Replying to my own comment in case anyone else wonders. I sauteed the veggies and threw everything else in the crock pot, including the mushroom “bacon.” Cooked on high for 6 hours. Perfection! It turned into a creamy gourmet chili-type meal that we thoroughly enjoyed. 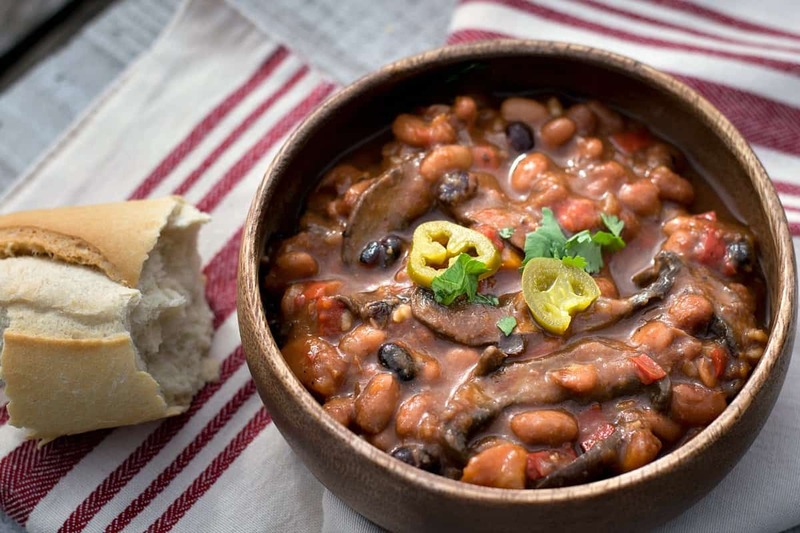 Will definitely be making this again – and has made me rethink using canned beans in my other crock pot recipes! Win win! Thanks Chuck!! I made this tonite! I added a chopped jalapeno to the veggie mix. Served over a bed of steamed spinach. Topped with el yucateco chile habenero salsa. Oh yum! Looked so good I just had to make it today. Also used some hot sauce, per your recommendation. I’ll definitely be making this again. It is GOOD! Made this tonight. We both really liked it. I did add a big dollop of misso paste to it and some baby spinach right near the end. Yummy. I will use the mushroom bacon in a lot of other recipes. Thanks Chuck. You!! I am trying to help him become healthy without shoving it down his throat. This soup did the trick. It is DELICIOUS!! It will be a staple in our house for sure!! Made this last night & had leftovers for lunch today. Absolutely amazing!! This is soooo good! 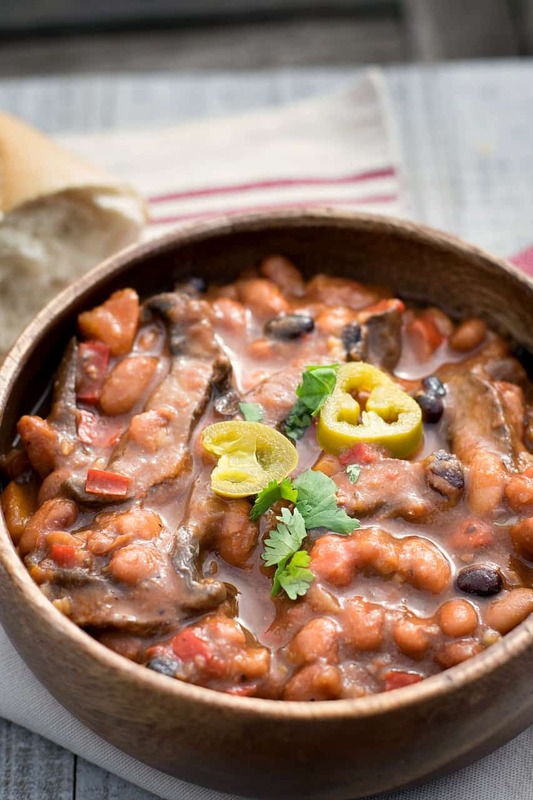 didn`t have any pinto beans so I used navy beans and it is wonderful! This will be a much repeated recipe! Oh my. This is the best bean soup ever. Will have this for dinner with cornbread muffins. Thank you Chuck for yet another home run recipe. I appreciate your sharing. We just made this tonight and it is absolutely delicious! I have never made anything with dried beans before so I’m not sure if this is normal but the beans were a little firmer than I’m used to. They seem like they could have cooked a little bit longer. Do you have any tips? You can always soak them a little before cooking next time. Or just cook them a little longer. I have made countless bean soups and loved most of them, but I think this is my all time favorite. I do presoak my beans so I reduced the liquid in the pressure cooker. And happily, a double recipe fit in there very nicely. I partially blended the soup before adding the mushrooms since I like the mixed creamy and chewy feel that gives. Hi. I really want to try this recipe. 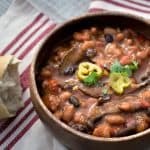 Can I used canned beans instead and how would I adjust the cooking time? Thank you! Made this tonight. Had the recipe for months but tonight I had the right ingredients. Should have made it long ago. Oh wow. Fantastic.